I’m building this blog right over the top of our former blog, Aboard Insolita. That means that everything prior to this post is not about our current boat but our former one. 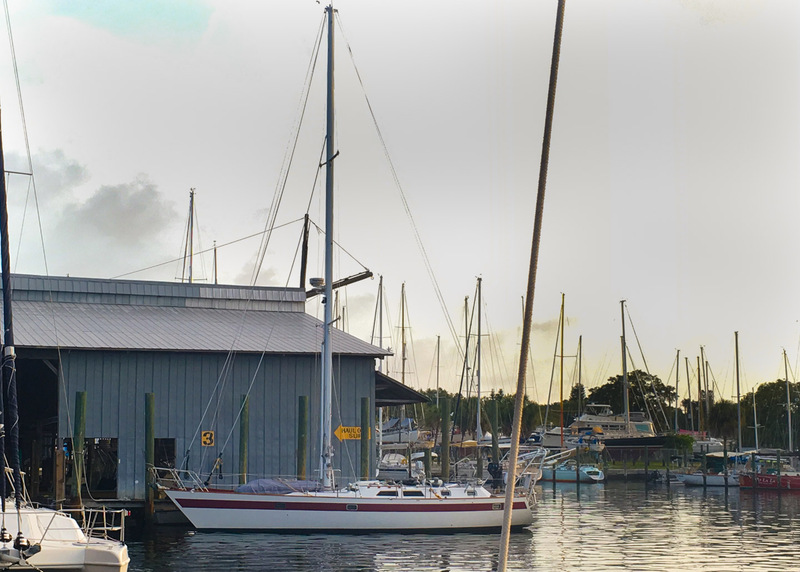 Well, we’ve gone and done it … We bought a new boat! She’s a lovely 1984 Norseman 447 center cockpit. Meet Lutris, or soon to be Lutris. Lutris means otter in Latin. We like Sea Otters, and liked the name, and there ya go. 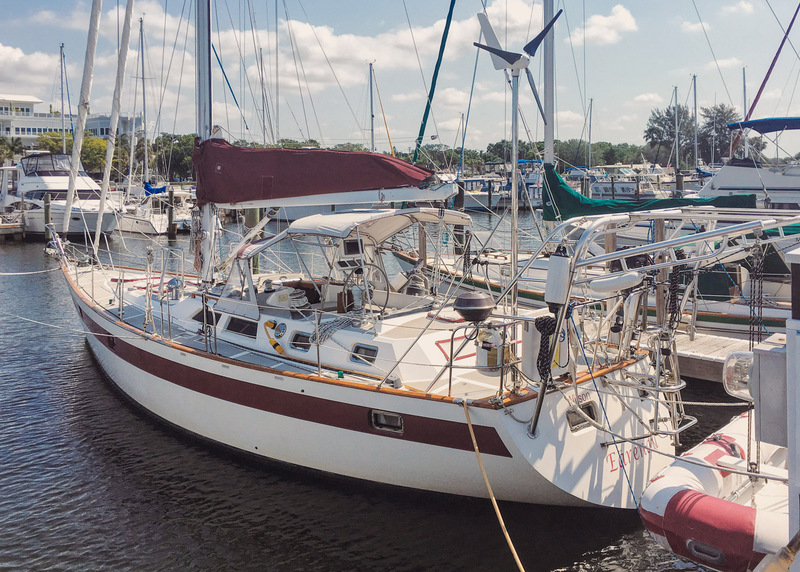 We purchased our new Norseman 447 in Palmetto, FL, which is just south of Tampa, from 2 delightful cruisers named Jill & Bud. My way-to-good-for-me friend Scott flew down with me a couple of days before, inspected the boat, and went out on sea trials with us. 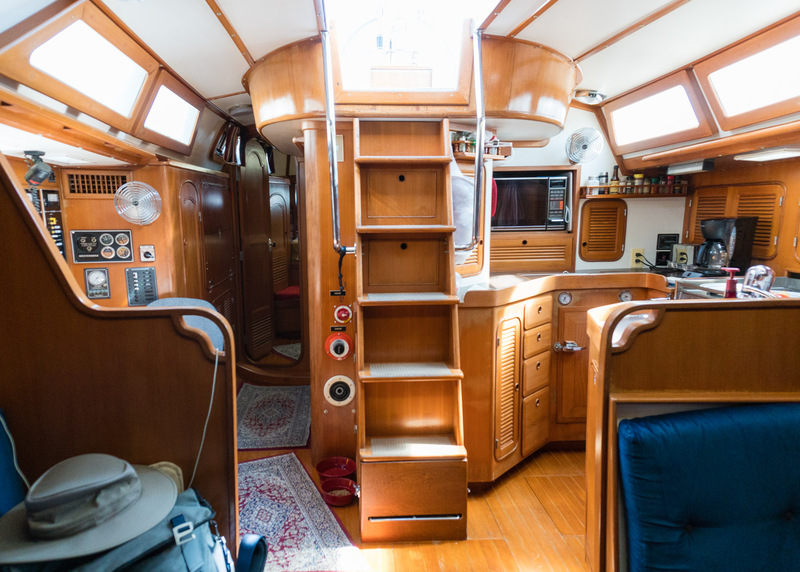 Since everything was to our liking, we finalized the paperwork, and headed over to Snead Island Boat Works, where we spent the night tearing the boat down for our morning haul and lift on to the waiting trailer. With the previous owners off the boat, and Scott at a hotel, I spent the night on the boat myself. It was the kinda of evening you need to spend on a boat, a nice red, some good music on my iPad and me sitting on deck watching the sun go down over the gulf. There is a lot more to say about this boat, and what our plans are, but for now I’m just overwhelmed that it’s happening, and so quickly. We bought a new boat, a boat Hong hasn’t even laid eyes on [she’s seen a few sister ships though]. How neat is that? Playful master of the element of water, please teach me to swim joyfully through life. As you leap and dive and slide, may I also remember that play is essential to survival. Help me take pleasure in sharing and receiving. At ease with the world’s abundance, help me to move with quickness and grace. Adapting to any environment, help me to always remain curious, ever seeking new perspectives and experiences. Open to love and laughter and all the mysteries above and below the surface of my life.